The BIOAIR adapts to the user’s foot – and lets you breathe freely with every step. The most natural form of walking is barefoot. However, our working life with its hard surfaces and numerous risks of injury no longer allow us this luxury. 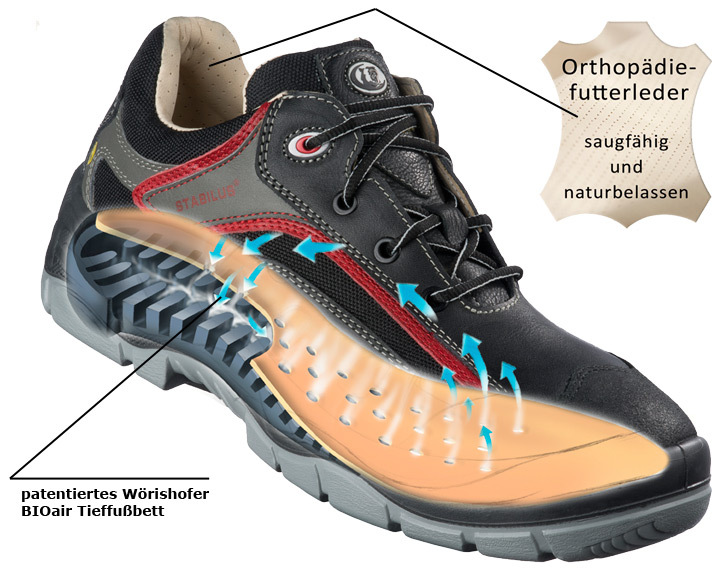 How can a work shoe combine external safety and internal comfort and the highest level of “freedom”? Stabilus has the answer, with the BIOAIR range. » The integrated lamella foot bed is perfectly anatomically shaped. » The anatomical shaping of the insole with its rounded heel promotes blood flow. » Equal pressure across the whole surface of the foot is guaranteed. » Shock absorbers in the heel area and the soft midsole layer ensure optimum cushioning. » The deep foot bed has been proven to protect the spine and joints. A tailor-made suit with climate control. This is the result of the well-thought-out combination of the perforated, vegetable-tanned leather insole and the hollows in the deep foot bed. Every movement creates a pumping effect which creates exceptional circulation of air within the shoe. Even when there’s hot work to be done, sweaty feet are a thing of the past with the BIOAIR range.